Equipped with tuner and tap tempo outs, MIDI In & Out and more. Features eight mechanical-relay controlled, true bypass loops. Provides 128 presets: 16 banks with 8 presets each. Tap footswitch sets the BPM. 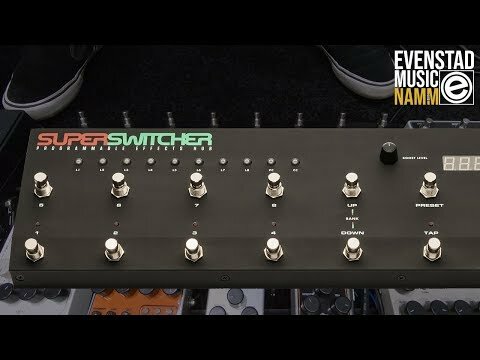 The Super Switcher can be configured to send/receive MIDI clock and send tap signals to the output. BPM can be global or per preset. Tuner footswitch sends the input signal to the tuner out and cuts off the signal from any loops or output. Boost footswitch engages a knob adjustable, output gain Boost on both the left and right channels.